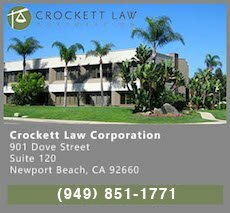 Orange County Trust and Probate Lawyer David L. Crockett offers his clients top-notch legal representation in the area Probate, Probate Administration, Probate Litigation, Wills, Trusts, and Estate Planning. When a loved one passes away without a Trust, Probate Administration is the result. For the inexperienced, the complex Probate process can be intimidating and include a series of steps that must be addresses in precise order. We can help you understand and navigate the Probate process as quickly and efficiently as is possible given the backed up probate courts. There are legal documents to draft and file, petitions to publish, bonds to file, and notices to serve. For the past three decades, Orange County probate lawyer, David L. Crockett has been helping clients deal with their probate cases in Orange County and beyond. Mr. Crockett is on a first name basis with the probate judges, courtroom staff and is not making common probate-court mistakes that take time to resolve where others inexperienced lawyers new to probate court find themselves in a strange new world. We are able to help our clients navigate the probate process as quickly as is possible to make sure that our client’s probate cases are completed quickly and efficiently. After a loved one passes away, assets will need to be managed and distributed and that is when squabbles and disputes arise between Heirs and Executors of a Will or Beneficiaries and Trustees of a Trust. Where there are disagreements about the handling of probate assets or trust assets people are entitled to file litigation in the probate court. A probate court lawsuit is known as a ”petition” which is a written document getting all of the details that the person filing is complaining about. If people are not happy about the progress of a probate or a trust administration they can file a court petition to have the trustee removed and essentially put pressure on the trustee or administrator to get the job done. Sometimes court petitions are necessary because people don’t think that the law actually applies to situations involving relatives. Nothing could be farther than the truth. Most probate and trust disputes involve fights among relatives such as stepson again stepmother brother against brother or sister against sister. It can get really messy. This is very common and you should not feel embarrassed that you are in a family squabble – I’ve actually written about some actual family disputes and posted those articles [ here ] so you realize that this is very common. I want to encourage you that you are on the right track; you will need an experienced trust and probate expert to help you settle the dispute before the estate lays in ruins and everyone becomes a loser. Misunderstandings and arguments sometimes evolve into legal battles which can result in complex Trust and Probate litigation and trial. Because we have been in Probate and Trust litigation for more than 30 years, we have unparalleled experience in resolving these complex cases. Most litigation lawyers and trial attorneys have no experience in probate and trust cases; while many “transactional” probate attorneys have little or no experience in trial work. We are experienced probate and trust litigators, meaning that we are very skilled at handling complex trials in the trust and probate context. Because of our vast trial experience - when “the other side” and their counsel learn of our experience and willingness to go to trial, they are often responsive to settle at the negotiating table without the need for an actual trial. Orange County Probate Attorney and Trust Lawyer, David Crockett, has a full-service estate planning practice that can help any client, whether he or she has never created any type of Will, Estate Plan, and this is a first time –or– you are facing a sudden emergency in your family. Attorney Crockett has drafted Estate Plans for numerous Orange County families. These Estate Plans include Wills, Trusts (including so-called Living Trusts and all sorts of specialized Trusts), Powers of Attorney for Finances and Powers of Attorney for Healthcare. When you get an Estate Plan for your family, you will be protected from Probate and Trust Disputes, avoid Probate which will save your heirs from unnecessary and expensive court proceedings; and as a bonus, eliminate or reduce state and federal taxes. Win – Win! I encourage you to reach out to make that free introductory meeting with me by calling (949) 851-1771. There is absolutely no pressure whatsoever. Typically, people will want to sit down with a trust and estate planning lawyer to discuss their current trust documents or explore what types of trusts might be beneficial for your very specific life situation. I am pleased to offer this complementary legal service to residents of Orange County and beyond.